CINCINNATI -- At 59 years old, Laurie Hughes is finally building her dream house, equipped with a studio, art gallery, workshop and a view from her bedroom that puts her at eye level with tree tops. 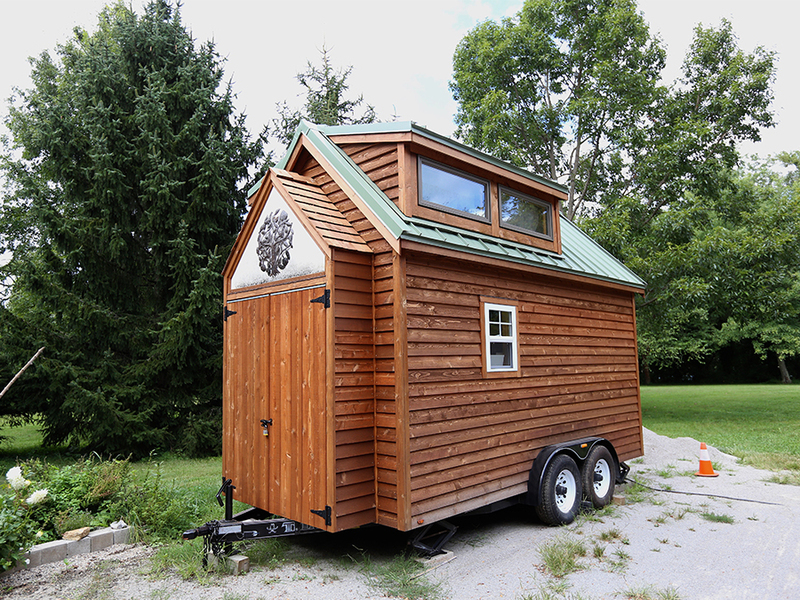 And it all fits within 140 square feet on a 7-by-14-foot structure. “Many people’s bathrooms are bigger than that,” Hughes said. Hughes is one of thousands taking part in the newly popular tiny house craze -- a movement that has spread quickly over the last few years and grown in popularity among those looking to downsize their life both physically and spiritually. The Northern Kentucky artist has spent the past three years building a Tumbleweed Houses brand home. The Colorado-based company offers several tiny home designs for individuals to purchase and assemble on their own. According to the company's website, the two biggest groups purchasing tiny home plans include those over the age of 60 looking for affordable retirement plans and millennials struggling to pay off school debt or seeking inexpensive alternatives to paying rent. Over-the-Rhine resident Ashley Hunt decided five months ago she didn’t want to keep wasting money after more than a decade of paying rent. The 29-year-old and her boyfriend, Dan Jensen, 26, wanted to secure their finances without limiting their future. So they purchased a retired school bus in February and converted it into a mobile home. "We wanted something we could own and not be fixed to one location," Jensen said. Hughes began her home search in 2010 after receiving a small inheritance following the deaths of her parents. As a lifelong artist, she had been seeking ways to financially secure her future. Buying a house made the most sense. But after years of looking and not being able to afford a new home or to rehab an old one, a friend urged her to look into tiny homes. Her search led her to Tumbleweed Houses, where she could finally envision a new future. "Along the way I realized after I started to look at Tumbleweed Houses ... that there was a tiny house movement," she said. "I’m not usually on the forefront of anything so it was like, 'Hey, cool!'" Hughes, along with her carpenter friend Kyle Meadows, took a Tumbleweed workshop in June 2013, where they learned about the building process. In August she ordered a specially manufactured 7-by-14-foot utility trailer and by fall began construction. She ordered the smallest house design offered at the time. “I’ve been thinking of it as an adventure,” Hughes said. Over the year she’s been downsizing her Covington apartment of 22 years with one storage unit already full. But as a self-proclaimed packrat, Hughes is realistic about her future. “I don’t really have the intention at all with only living with that amount of stuff,” she said. Hughes plans to use her tiny home mainly as a traveling studio/gallery space so she can teach art workshops on the road. She’s been taking a Co-Starters course through ArtWorks to draft a business model. "I sort of envision doing that for a few years and if or when I find a forever home for the house, I will stay there and build a stone foundation. And then build a HUGE addition," she said. The Connecticut native plans to take her house on the road for to visit family and friends throughout New England and teach along the way. She thinks it will be another year before she will be able to hit the road, which will give her time to save enough money to buy a truck to haul 10,000 pounds — around 5,000 for the trailer and 5,000 for the house with her belongings inside. With the exterior construction finished, the next phase for Hughes is to finish the kitchen and bathroom. And when dealing with only 140 square feet, every inch counts. Hughes doesn’t want to sacrifice everything. The interior is cozy and bright with artwork strategically placed on walls and cubbies, flowers hanging on the walls and repurposed windows throughout to allow ample light. The main floor will encompass the kitchen, bathroom, a sitting area made from a futon frame and mattress and a large window behind it. A ladder propped against a wall leads to the bedroom loft, which is big enough to fit a twin mattress and baskets for clothing storage. Hughes doesn’t expect to live off a grid since the house relies on electricity using household current. She also won’t have running water because the model of her home isn’t large enough for a water tank. But for Hughes the biggest risk was the one least expected. “I joke with my parents, ‘Did you ever think your 30-year-old daughter would be moving into a bus?’” Hunt said. Born in Cincinnati, Hunt has lived all over the country and abroad, including Costa Rica, India, British Columbia and Haiti. When she and Jensen wanted to buy, they didn’t want to be stuck in one location, which attracted them to tiny houses. Hunt, a jewelry designer and yoga instructor, and Jensen, a chef, first looked into buying a tiny house from Tumbleweed, but most of the designs were too short for Jensen’s 6-foot-7-inch stature. The plans for a tiny home that would be tall enough would have cost thousands of dollars more, exceeding their budget. 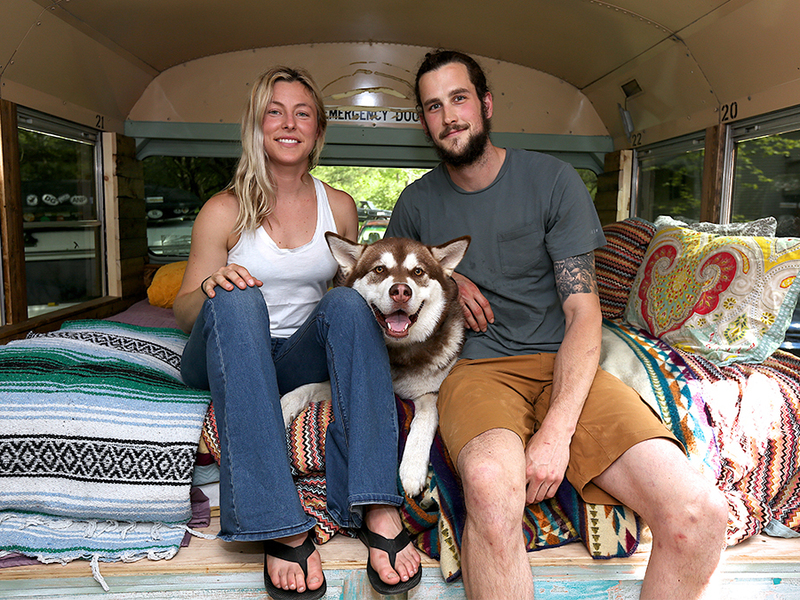 They considered buying a camper for travel while keeping their Over-the-Rhine apartment, but the couple was tired of throwing their money away on rent. An Airstream trailer or bus seemed to be the best option. After a few weeks of looking, a friend mentioned a listing for a school bus on Craigslist in Adams County. The previous owner turned the vehicle into a mobile tattoo shop equipped with painted purple flames on the outside and the word “Margaritaville” gleaming from the front. “I had never driven a school bus before or anything close to this large so it was anxiety provoking to say the least,” Jensen said. With the seats already removed, a new motor and the vehicle titled as an RV — meaning a special bus license wasn’t required to drive — they couldn’t pass it up. “I definitely have a new respect for school bus drivers,” Jensen added. Hunt and Jensen purchased the bus in February. Within three months — and with the help of friends — they renovated the interior with a king-size bed, new flooring, composting toilet, kitchen area, dresser and office counter. They had a surprising 8 feet of extra space leftover that they will turn into a small dining area. Right now they are keeping the bus on a friend’s lot in Milford until renovations are finalized. The next phase includes adding a 40-gallon water tank, solar panels and a 3,000-watt battery tank. They also plan to eventually raise a portion of the roof to accommodate Jensen’s height. And yes, they plan to paint over the Jimmy Buffett theme to a neutral tone so as to not stand out when traveling. On May 1, they officially moved into Margaritaville. “The goal was to get it livable,” Hunt said. They downsized from an 800 square foot apartment to just barely 200 square feet on the bus. But they said the transition wasn’t difficult. The couple and their 2-year-old Alaskan malamute, Nihla, practiced in the months leading up by downsizing their living quarters to only the living room, bathroom and kitchen. “There was a period when we moved out the bedroom where it was like, OK, now we’re stacking our clothes next to cereal boxes in the kitchen and we’ve got our toothbrushes next to our forks just to experiment,” Hunt said. After months of sleeping on a couch, Jensen was happy to have a bed again. “It was way more comfortable here…so it was a pretty easy transition,” he said. Even with more work still ahead, both Hunt and Jensen are happy with their investment. So far they’ve spent a total of $7,500 on their bus home and don’t expect to exceed $15,000. “That’s better than a used car nowadays,” Jensen said. They hope to hit the road within the next year. Hughes will never forget spending the night in her friend’s driveway in her tiny house. She remembers waking up and looking out the windows of her loft and being at eye level as the birds in the tree next to her home. 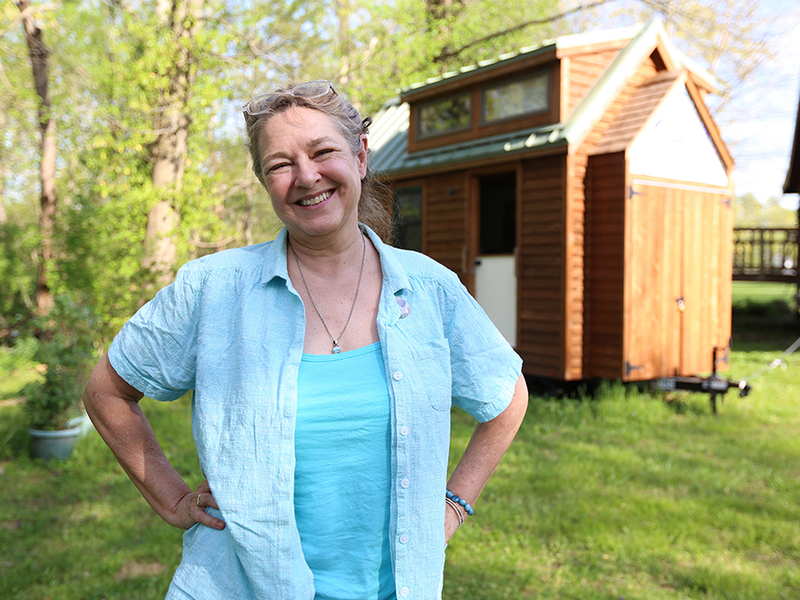 “That’s part of what’s driving the entire thing — having a tiny house that will keep me closer to nature,” she said. Despite being behind on construction, the process for Hughes has proved to be nothing less than a labor of love. “I love planning and designing parts for it,” she said. “I did have a thought along the way…this is the first tiny house I’m building. The next one will be longer." While Jensen and Hunt have only lived on the bus for a few weeks, they’re excited to finish production and begin their next chapter. As avid rock climbers and campers, they’re ready to seek new adventures. “It’s definitely freeing for me," Jensen said. "There aren’t roots here and now that our house is on wheels we can go wherever we want when we want." For Hunt, physically downsizing her living space has created a less hectic lifestyle. Less physical space has leant her to more mental space, she says. She’s often asked through her blog about the process and is hoping others are able to take away a similar experience.